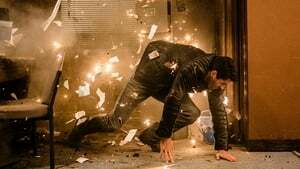 For years, Scott Adkins has worked as a screenwriter on a screen adaptation of the little-known British comic “Accident Man”, until – thanks to Sony funding the chance to realize the project resulted. For the direction he won his compatriot Jesse V. Johnson, with whom he had previously shot “Savage Dog”. Mike Fallon (Scott Adkins) is also known as the Accident Man, as the London professional killer always makes his murders look like an accident or even a suicide, as the opening scene shows. The pent-up energy, referred to by him as PMT (Post-Murder Tension), he likes to discharge in brawls in shady pubs.